Minaret Kalyan is the main symbol of holly Bukhara. Minaret Kalyan is strong, majestic and balanced in its monumental and a little bit massive shapes. At the same time it is distinct, clear and filigree fine worked in all details. Its proportions, divisions are of big taste. 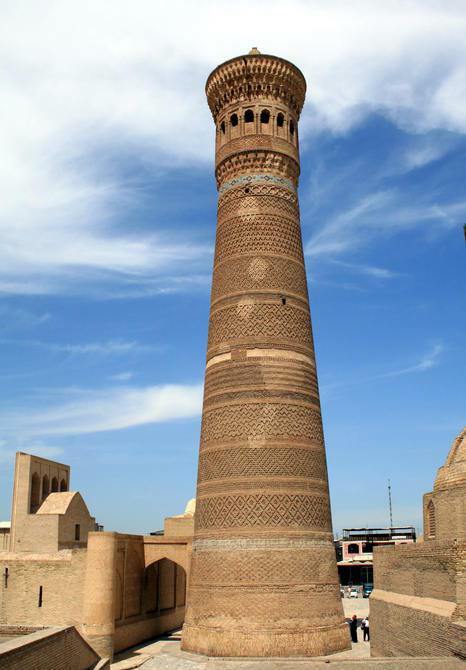 During many centuries minaret Kalyan survived all earthquakes, which destroyed many tall constructions in Uzbekistan. The secret of its stability is in empirically right found correlations of the parts of the building, in the construction of its fundament, in a good quality of the brickwork. There are notes on its three belts: date of construction – 1127, name of the donor – ruler of Bukhara Arslankhan and the name of the constructor – usto Bako. There are many legends about Minaret Kalyan. The name is translated as “Big tower”, “Tower of death”. In ancient times many people were executed and thrown down from the top of the tower. In one old legend it is said, that many times ago one shakh lived, who had a wife. He was a cruel man and decided to kill his wife. He decided to push her off from the top of the tower. But she was a very clever woman and she asked her husband, that he would implement her last wish. He agreed. At execution day she appeared, she put on many dresses and skirts. The wise woman went upstairs the top of the tower very calmly, and all people were waiting in the square and watched. When she jumped down from the tower it was like a miracle: she did not die, because her dresses filled out and she easily went down to the earth.